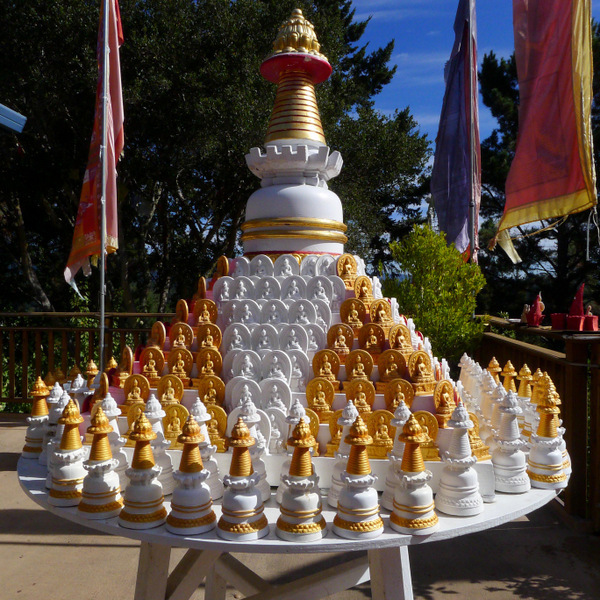 Stupas at Kachoe Dechen Ling, Aptos, California, October 2012. Photo by Ven. Katy Cole. 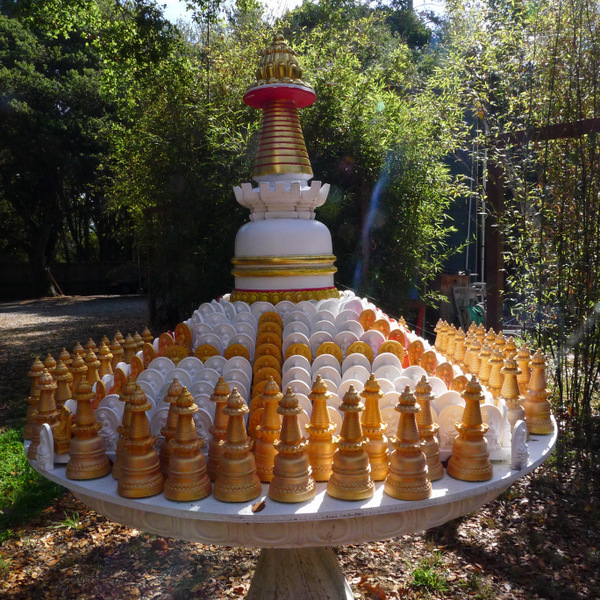 Lama Zopa Rinpoche recently expressed a wish to share photos of some of the stupas at Kachoe Dechen Ling, Rinpoche’s house in California, to illustrate how stupas can be part of our daily life. The stupas in the photos were installed according to Rinpoche’s advice so that they can be walked around when talking on the phone and as part of the daily comings and goings. 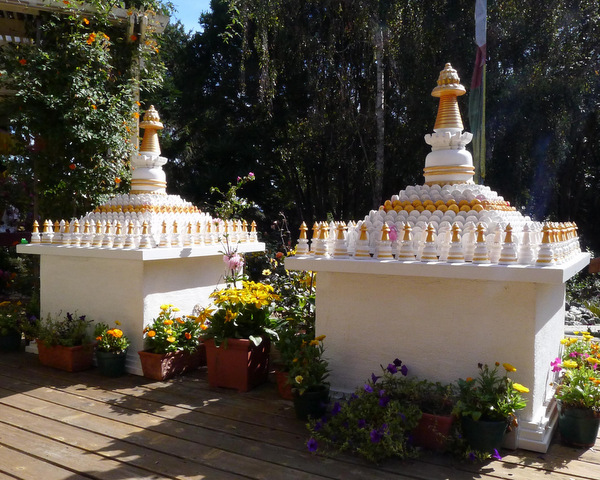 Stupa at Kachoe Dechen Ling, October 2012. Photo by Ven. Katy Cole. Rinpoche shares the story of how he came to give this advice. One day, Rinpoche was talking on the phone and walking round “all the relics, pictures of Buddha, and tsa-tsas that I [had] piled up on a round table in my room.” Rinpoche had the thought that Ven. Roger (Rinpoche’s attendant) and Ven. Holly (Ven. Roger’s assistant) should have a stupa to walk around for the many hours they spend talking on the phone. Rinpoche then thought to extend this advice to all centers and the International Office. “Arrange some small stupas on a table. It can be many tsa-tsas, but especially you should have some stupas that contain the four powerful mantras, as well as photos of Buddha, statues, texts, etc. It should be beautifully set up, very pleasing and inspiring. 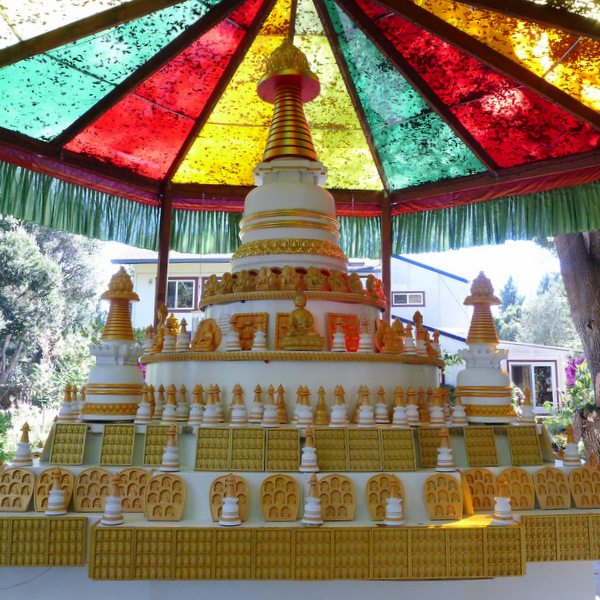 Make delightful offerings – flowers, water, lights and other offerings – around the stupas. The seven precious royal emblems and eight offering goddesses, carrying offerings, etc., can go around the edge of the table. The stupa could be either in the garden, in the middle of each room, or in the center of the building,” Rinpoche advised. For more advice from Lama Zopa Rinpoche, visit Rinpoche’s Advice page on fpmt.org. Lama Yeshe Wisdom Archive also offers advice from Rinpoche in their Lama Zopa Rinpoche’s Online Advice Book. With 160 centers, projects and services around the globe, there is always news on FPMT activities, teachers and events. Mandala hopes to share as many of these timely stories as possible. If you have news you would like to share, please let us know. If you like what you read on Mandala, consider becoming a Friend of FPMT, which supports our work.